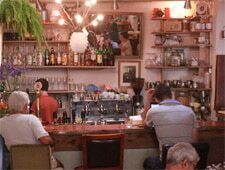 Funky, homey restaurant in the heart of Jaffa’s famous flea market serving Israeli "soul food." : Adorned with mismatched tables and chairs, vintage lamps, antique pictures and fresh market flowers, Puaa happily celebrates the old-world charisma of Shuk Hapishpeshim, Jaffa’s famous flea market. The food has a warm, cozy appeal, channeling classic Israeli "soul food." Puaa’s famous robust green tahini served with warm laffa bread is a good starter that hints at the essence of the meal to come. The menu is filled with a variety of vegetarian dishes, fresh market salads and meat options. The roots salad integrates beets, celery, cabbage and carrots and is complemented with nuts and a tart sesame dressing. Seeking a hearty dish? Try the chestnut gnocchi. For dessert, indulge in Puaa’s version of kanafe, served in a tall glass and layered with mascarpone and crispy phyllo and covered in a light orange blossom water. With a small wine and beer menu, Puaa is just the place to enjoy a glass of vino or sit down to a homey meal while soaking up the buzz of the surroundings.